Arms, videlicet: Per fess wavy Sable and Barry wavy of six Argent and Sable, in chief a crescent Argent. Crest: Upon a craggy rock a wolf statant ululant Argent. 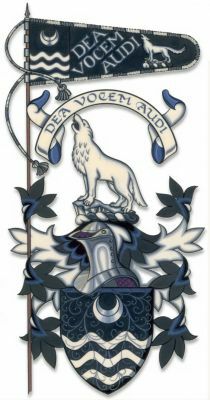 Pennon: 120 centimetres long or thereby Sable with the Arms of the Petitioner in the hoist bearing his motto “DEA VOCEM AUDI” in three lines in letters Argent with the crest of the Petitioner in the fly, the said Pennon being limited to the Petitioner and his successors in the said Armorial Bearings. Matriculation: Recorded on the 65th page of the 88th Volume of the Public Register of All Arms and Bearings in Scotland. The artwork is a rendering by Mrs. Yvonne Holton, Herald Painter to the Court of the Lord Lyon and Dingwall Pursuivant of Arms.